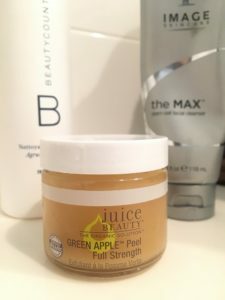 Juice Beauty Green Apple Peel Review and Results! Is this Gwenyth Paltrow's Secret? Even though it’s pricey, I love Whole Foods! When I was there shopping last week, I decided to check out their skin care aisle to pick out an organic fruit enzyme mask. The Juice Beauty Green Apple Peel Full™ Strength stood out to me based on both ingredients and price – it was one of the most expensive being a top shelf brand, and contained alpha-hydroxy acids (not that price always = quality). 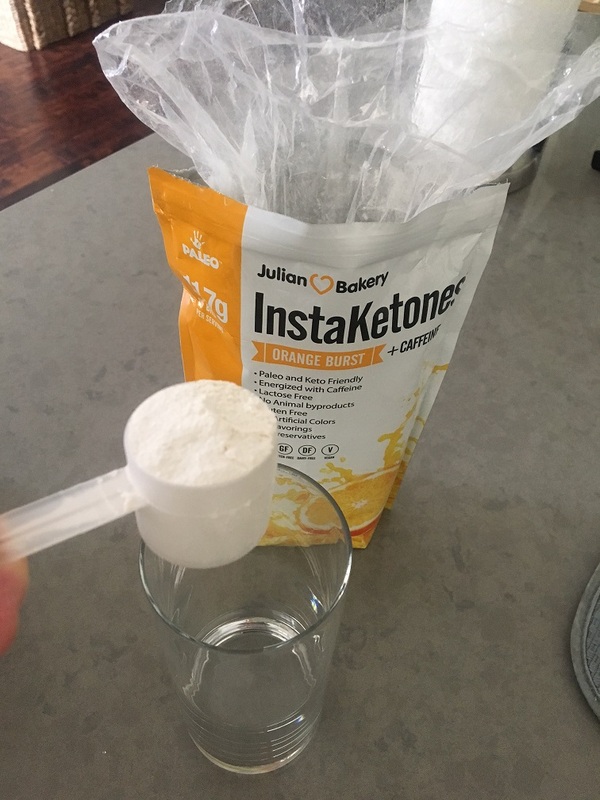 I am familiar with this brand because a Juice Beauty representative had given me samples one time and was extremely knowledgeable and friendly. 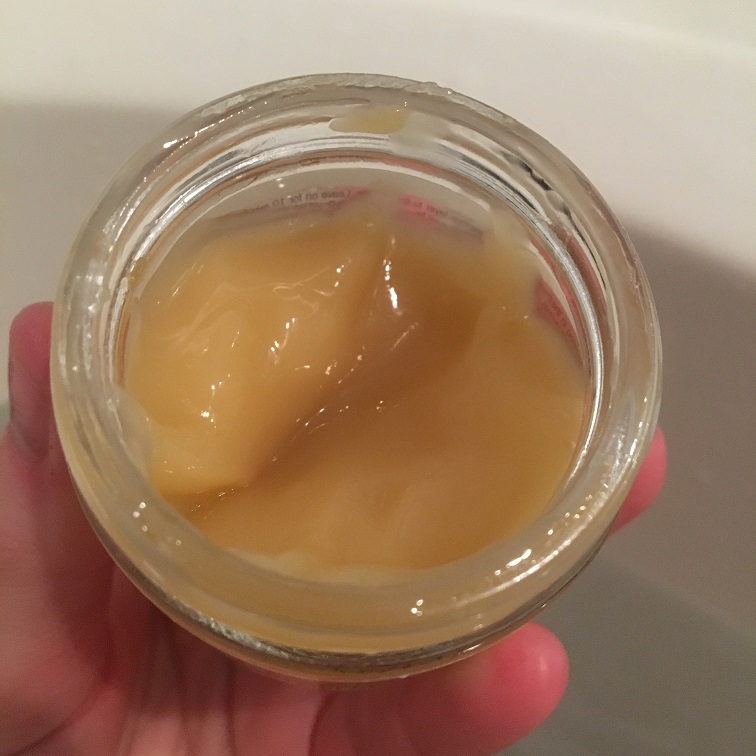 The Juice Beauty Green Apple Peel left my face nicely exfoliated, soft, a little pink for a while, but it really gave me the feeling that I’d had a stronger treatment. 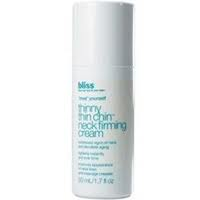 It does tingle because it contains AHA’s, but that’s what helps to resurface the skin so nicely. So let’s take a closer look at the Juice Beauty Green Apple Peel to learn why it’s so effective, and why Gwyneth Paltrow loves their products! The Juice Beauty Green Apple Peel claims to deliver spa-grade exfoliation using potent alpha and beta hydroxy acids, revealing a brighter complexion while reducing the appearance of fine lines and wrinkles, as well as dark spots and discoloration. Quite simply: Age defying. And at $47.99 for a 2.0 oz glass jar, I had high hopes it would be just that! This peel is not recommended for sensitive skin since it contains AHA’s, so be careful if you’re not used to using stronger products. They use primarily USDA Certified Organic Ingredients to harness the power of anti-oxidants while limiting pesticide and fertilizer residue. Who wants that on their skin? Not me! Gwyneth Paltrow loves Juice Beauty, and we all know she’s a big proponent of all things natural, organic, and friendly to the environment. Gwyneth is actually Juice Beauty’s Creative Director of Makeup! Love her, and she looks fantastic! 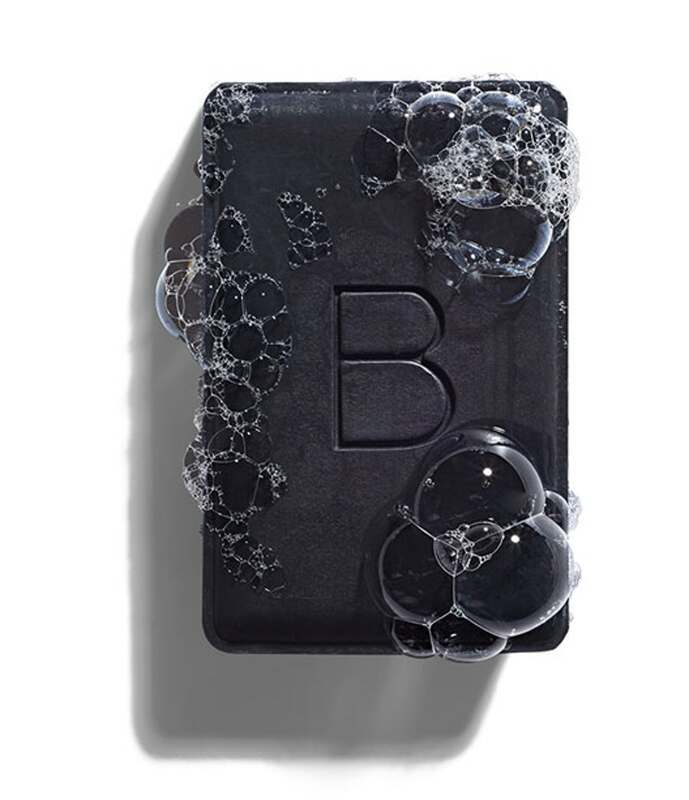 NO Parabens, petroleum, pesticides, propelyne or buttylene glycols, silicones, talc, carbon black, pthalates, sulfates, PEG’s, TEA, DEA, GMO, artificial dyes or synthetic fragrances. 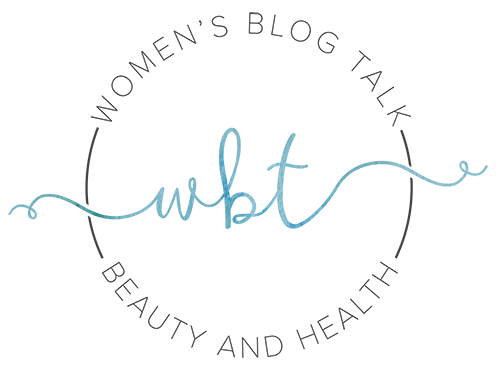 Vegan and No Animal Testing – formulated without animal byproducts. PETA approved and awarded. Are their products 100% organic? Only a few of them are, but most are 98-99% organic and that’s impressive. Juice Beauty does a great job of formulating non-toxic skincare, and has an entire Green Apple Skincare line of products. 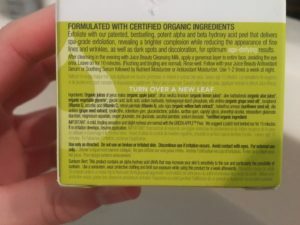 Ok, so off the bat, I had a hell of a hard time reading the ingredients label on the back of the Juice Beauty Green Apple Peel. It’s very small, and apparently I need glasses! Click to enlarge Green Apple Peel’s ingredients. 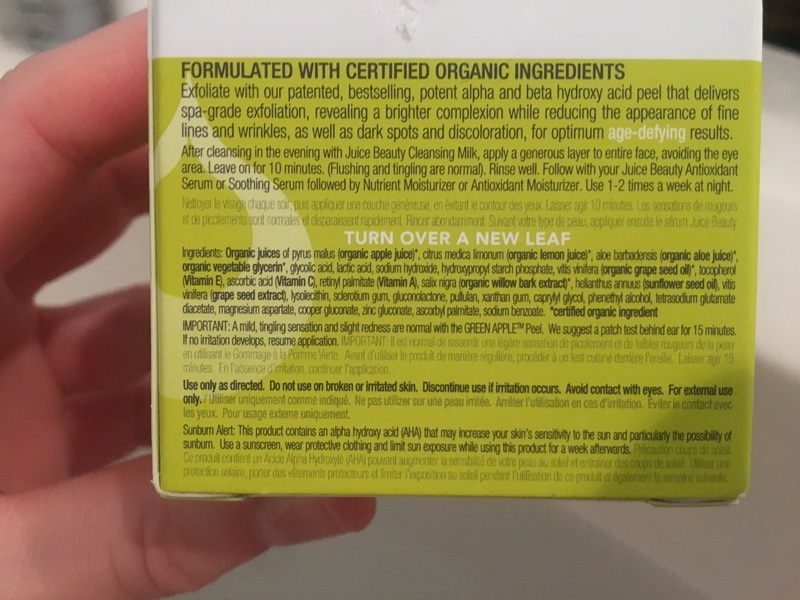 Here’s a picture of the ingredients label so you can take a look, and you can also find the ingredients listed on the Juice Beauty website. What’s so potent about this mask? The AHA’s of course! Here’s a list of the most potent ingredients and how they help the skin. Malic Acid, Apple Juice – vitamin rich, potent malic alpha-hydroxy acids, phytonutrients, phenols and flavanoids provides highly potent antioxidant properties to promote vibrant, healthy skin. The instructions are to cleanse the face and apply a generous layer of the mask and leave on for 10 minutes and rinse well. 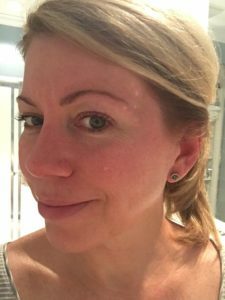 I used my Image Skincare The Max Stem Cell Cleanser (it’s gentle) to remove all makeup, but you could use any gentle cleanser. I applied the Juice Beauty Green Apple Peel to my face, neck and chest – my chest being my problem area. I’m a side sleeper so those wrinkles are setting in, ugh! I also have some dark hyper-pigmentation on my upper neck on both sides and I’m in a constant battle to lighten them. 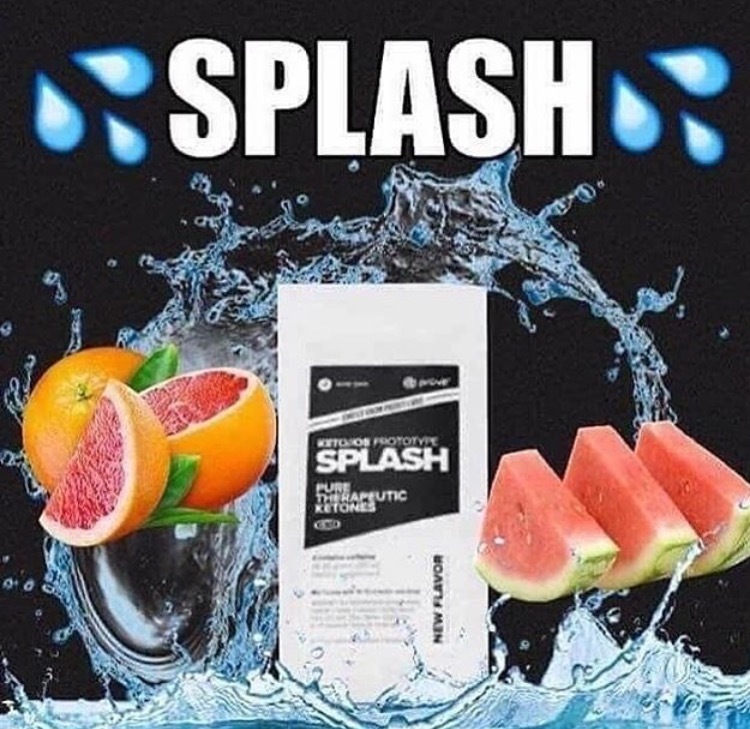 I could feel my face start to tingle and flush right away, so you can definitely feel it working! This is what I love about AHA’s and fruit enzymes, it exfoliates without you having to scrub and goes deeper into the skin. It does say on the box to expect this. Here’s what the mask looks like, it has a thick, gel-like slippery consistency. 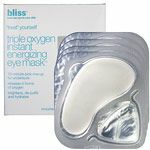 The smell is just what you’d expect from a mask made from the skins of apples, lemons and aloe – just a natural smell with a hint of sweetness. I was a little afraid to look in the mirror after I was done, since my face still felt flushed and I’d left it on a little longer than the directions called for, whoops (about 15 minutes). 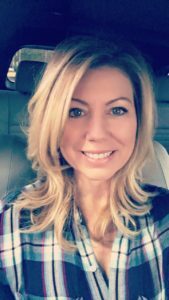 However, I was pleasantly surprised – even though I was a little pink, I felt like a I had a brand new layer of healthy skin revealed on my face, neck and chest and it was smooth to the touch. Since the Green Apple Peel is an AHA type of peel, it’s important to use something very gentle and “non active” to sooth and hydrate the skin right after. You can tell from these pictures that I definitely had a little pinkess and flush to my skin but it was no big deal, my skin didn’t feel irritated. Keeping with the natural, non toxic skin care theme, I used my Beautycounter’s Balancing Oil on my freshly treated skin to help calm the redness, hydrate and to get the benefit of having it penetrate more deeply post treatment. Did I just say post treatment? Yes I did! My skin felt like I’d had a spa grade exfoliating treatment done when I used this peel. I woke up with such plump, soft, hydrated skin the next day, my chest wrinkles softened, and my pores shrank! I’ve used this mask 3x now and my skin just seems to absolutely love this mask and I am continuing to love the results. My face seems brighter, lighter, and just has a healthy glow. I’m not sure if it lightened my pigmentation but I think it would make a difference with continued use. My spots are stubborn! I bought my Juice Beauty Green Apple Peel at Whole Foods for $47.99, but you can buy it directly from the Juice Beauty website for $48. You can buy from Amazon, but personally I don’t buy skin care from Amazon or Ebay because there are too many unknowns with various vendors and how they store it, etc. This mask exceeded my expectations and I’ve already texted pics to some of my friends and said you must try this one! 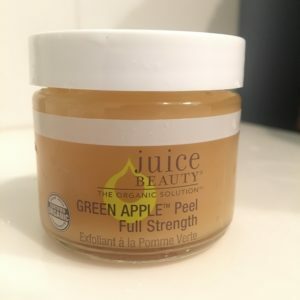 The Juice Beauty Green Apple Peel Full Strength is one of the most effective organic at home peels I’ve ever tried and I’m very happy with the results! My skin does well with occasional treatment with AHA’s and it really seems to refresh and renew my skin better than anything else, and over time it does lighten up dark spots and reverse sun damage. However, I know from experience that I can only use AHA’s 2-3x per week. Anything more is just too much for my somewhat sensitive skin. Questions or comments on Juice Beauty’s Green Apple Peel? Leave them below! 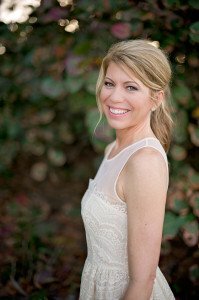 Want to see tighter skin when you look in the mirror? Your face will love Hot and Gold™ Firming Face Mask by Perfectly POSH! Formulated with caffeine and colloidal gold (real gold particles suspended in liquid), this mask transforms lackluster, aging skin, reducing fine lines and wrinkles and brightening for a more youthful look, all in a luxuriously hydrating, glycerin vegan base.